The most iconic of all Decepticons in the G1 line-up was not Megatron nor Starcream, but the dronish, emotionless Soundwave. Personally, back in '84, I didn't see what everyone liked about Soundwave, other than the fact that he was big and housed cassette robots. He had mediocre articulation (his legs bent backwards). His weapons (batteries) were nifty enough, but Soundwave just wasn't for me. The cartoon clarified his role to me, though. After watching a few episodes it left me with a better opinion of him. He was a colder villain than Megatron himself. He was an excellent warrior and an even better "reporter". After all, in the grand scheme of '84, no one on Cybertron would have figured out that a Panasonic Cassette Player measuring 4 inches across, could transform into a robot over 35 ft tall. This is Soundwave's triumph. 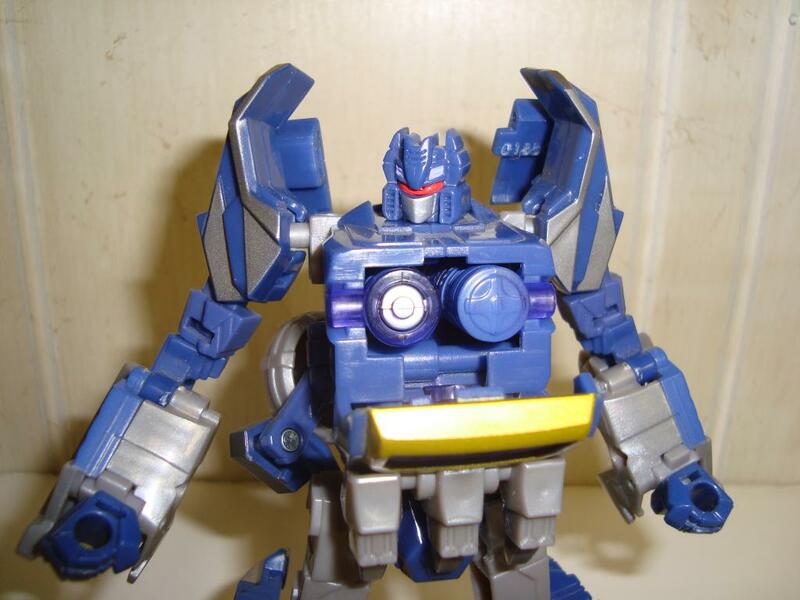 I loved this version of Soundwave because of the great robot mode. I contend that this is THE BEST Soundwave EVER because of several factors: 1) The robot's head is VERY G1! Who cares if the rest of the body is "alien", the head says it all. 2.) This has all the articulation that everyone wished that the G1 character had. It is the most posable version of Soundwave ever. 3.) His weapons are more versatile than G1, but look precursor to G1. 4.) His overall appearance looks completely menacing. I loved the shoulders and the throwback chest. This guy looks so G1 without actually being G1. 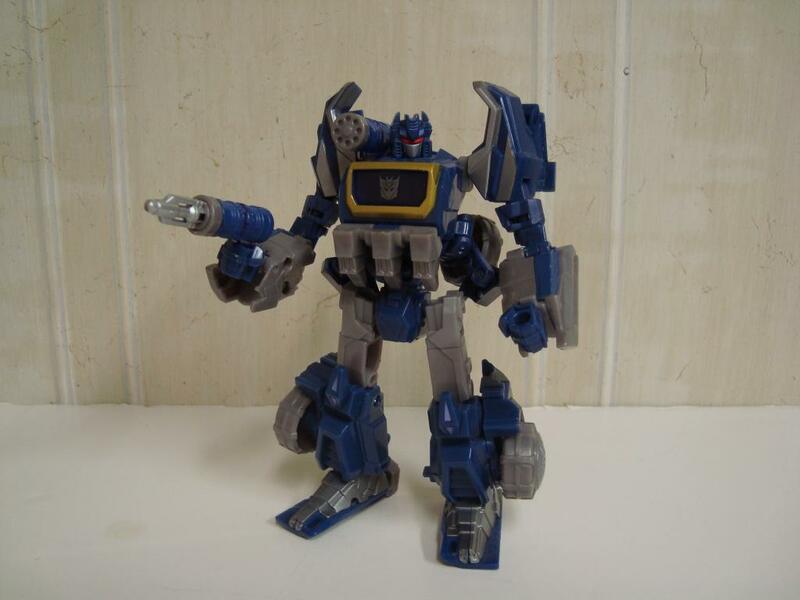 I am definitely replacing my ROTF Soundwave with this one! To me there is no comparison between the two. 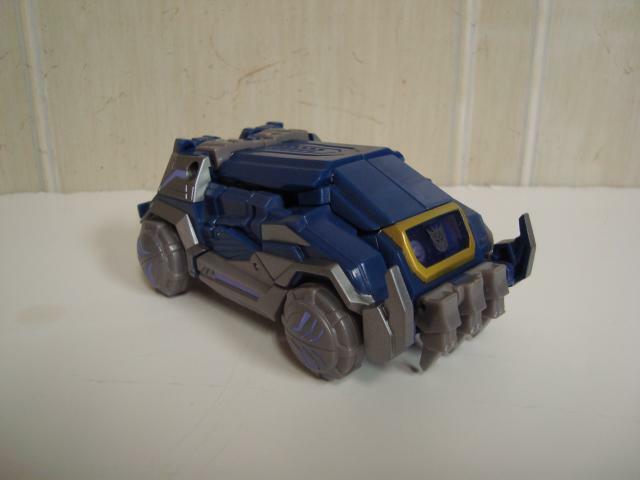 WFC Soundwave has a definite alt mode. What was ROTF Soundwave again? A Vector Prime wannabe? I hated that version! My only bone to pick with him is that he is the same size as WFC Bumblebee. The game pictures Bumblebee as shorter than Optimus Prime, only coming up to Prime's sternum. Prime would have been shoulder height to Soundwave in WFC, making Bumblebee the midget he was supposed to be. Four figures in the WFC line should immediately been made in the Voyager class: Prime, Megs, Shockwave and Soundwave. Yet Hasbro has decided to make all the WFC's in the same scale, which warps the whole lot of them . What will they do with Omega Supreme? Will he be made at least a Leader class or will he go Deluxe as well? This is a curious alternate mode. It reminds me of the comm trucks from the US Military which are refitted Hummers and Jeeps. Although he isn't imposing in this mode, he still looks menacing with those weapons positioned on the sides of the vehicle. It looks like a vehicle that would dig for land mines as well. Given that Soundwave was not that courageous, he probably wouldn't try his luck at the land mines. Nonetheless, I like the alt mode quite well. Great G1 colors. Transformation Design: 7/10 Not exactly as complicated as HFTD Ironhide, but borderlines on Advanced transformation. The feet play a huge part in the process. Aesthetics: 10/10 This guy looks great either way. He has a menacing robot mode and a cool alt mode. Love the colors and obvious G1 paint scheme. Fun: 9/10 Weapons for a deluxe, not too hard, what's not to like? Try no little minions! What? No Laserbeak? Overall, I don't miss him enough to let the guy suffer a bad review. Too bad he's not a voyager. Price: 10/10 Loved not paying full price for the little squeaker. $10 at Wal-Mart -- great buy. Articulation: 10/10 This guy has the articulation everyone wished G1 had but didn't. Best part about the figure! Durability: 9/10No fragile pieces here. All pretty tough. Packaging: 8/10Good artwork, but why are we ditching the tech specs again? I had to get G1 specs to supplement this article. Overall: 10/10 Again, Classics knocked it out of the park with this figure! I would recommend this to any die-hard G1 fan. It's just simply a better figure.